The prequel to the New York Times best-selling Maze Runner series. Before WICKED was formed, before the Glade was built, before Thomas entered the Maze, sun flares hit the Earth, and mankind fell to disease. Mark and Trina were there when it happened, and they survived. But surviving the sun flares was easy compared to what came next. Now a disease of rage and lunacy races across the eastern United States, and there's something suspicious about its origin. Worse yet, it's mutating, and all evidence suggests that it will bring humanity to its knees. What could James Dashner have done to make this a more enjoyable book for you? He could have linked it better to the maze runner trilogy, giving some insight, some new facts about the political background. What character would you cut from The Kill Order? The main characters are badly chosen in general. 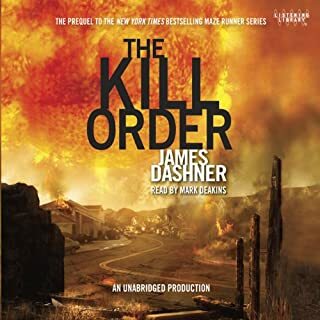 To make the prequel interesting to read, the story should be about the politicians giving the kill order, rather than the victims who only get a few glimpses of what is happening. I absolutely loved the maze runner trilogy and was looking forward to finally getting a load of answers in the prequel. However the author chose not to reveal anything that you didn't already know at the end of the trilogy. About 70% of this novel consists of close combat fights that are described in detail. I was utterly bored by it, and totally unsatisfied with the lack of a story. I hope that the next book in the series, "The Fever Code" will be the real prequel we've all been waiting for.